Joe Rex joined the U.S. Navy at 17 in February 1945 near the end of World War II. 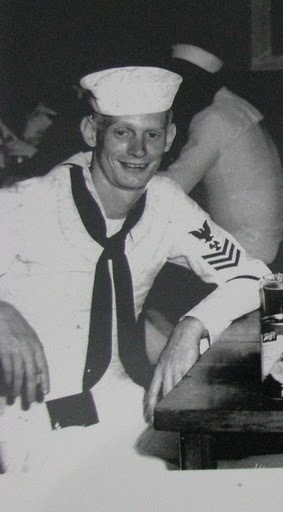 In 1970, twenty-five years later, he retired as a Master Chief Petty Officer. 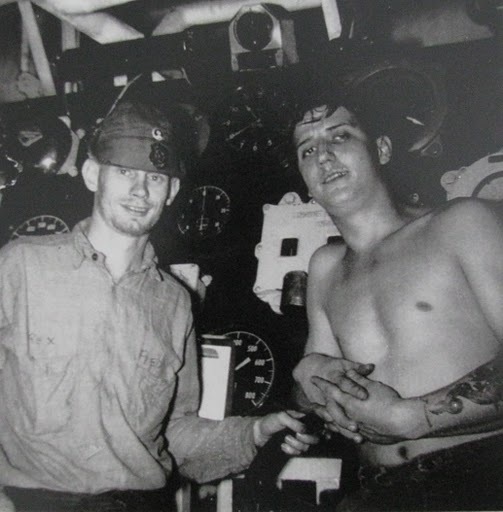 Although he was in the service during the Second World War, he served aboard the destroyer, USS Mole –DD-693—at the start of the Korean War and served as a Mobile Electronic Technician near then end of his quarter century in the Navy, Rex’s finest hour may have been during the Cuban Missile Crisis of 1962. Rex found out when his cruiser reached Norfolk, Va., headquarters of the Atlantic Fleet. The Soviets were about to go to war with the United States. Prime Minister Nikita Khrushchev of the Soviet Union was in the process of supplying Cuba with offensive nuclear weapons, much to the dismay of President John F. Kennedy. In the fall of 1962 Russian engineers secretly began building bases for a number of medium and intermediate range nuclear missiles. Their existence was first detected by American satellite photos. Navy Capt. William Ecker, who retired to Punta Gorda, Fla. and died there last year, flew a secret low-level photo-reconnaissance mission in an F-8 Crusader fighter over Cuba to take close-up photos of the offensive missile sites. These were pictures President Kennedy and U.N. Ambassador Adlai Stevenson used to publicly embarrass the Soviet leaders before the United Nations and convince the world Doomsday was almost at hand. The Cold War reached the crisis point when an American U-2 spy plane was shot down over Cuba. It was just about the time Khrushchev dispatched six freighters to Cuba with deadly missiles aboard. Kennedy’s advisors were telling him to invade Cuba and destroy the missile sites. At the very least, the president was advised to knock out the offending missile sites with air strikes. JFK did neither. He ordered the Navy to blockade Cuba to keep the Soviet missiles from reaching Cuba’s shore. At this point Khrushchev did something highly uncharacteristic of Soviet leaders. In diplomatic parlance he blinked. He sent Kennedy a letter saying he would defuse the incident by removing the missile sites if the president would guarantee the world publicly the U.S. would not invade Cuba. The following day the Soviet leader ordered the missile sites in Cuba dismantled. Secretly Kennedy also agreed to remove U.S. missiles from Turkey, a fact that was not made public for decades. Rex and the heavy cruiser Canberra were still in Norfolk when word was passed to him he was to come up to the ward room aboard ship. “You don’t pass the word for a Chief to lay up to the ward room,” Rex said emphatically 50 years later. “When I got there I met with the operation’s officer and two civilians. “The civilians explained they had something to show me. What they had with them were two portable neutron detectors. With this equipment we could detect a nuclear bomb aboard another ship from a distance of 100 yards or more,” the old salt said. “They explained that the two units they were leaving me were experimental. After they left I took the Geiger counter-like boxes on deck and tried them out on destroyers coming into port. You could tell right away if they had an atomic weapon aboard or not,” he said. By this time Rex and the Canberra were headed for the naval blockade that ringed Cuba. “We pulled away from the pier in Norfolk about 10 p.m. and went down off the coast at Charleston, S.C. and rendezvoused with another ship. We took Adm. A. L. Ailes, commander of the blockade, aboard our ship,” Rex recalled. “We could hear President Kennedy talking to our captain. The blockade had a Russian sub pinned down on the bottom near Cuba as six freighters steamed toward the island with Russian missiles aboard. Then all of a sudden the freighters turned around and went back to Russia. The Cuban Missile Crisis was over. Three months later Ecker received the Distinguished Flying Cross from President Kennedy personally at a ceremony at Boca Chica Naval Base in Key West for the part he played the incident. His unit, VFP-62, was awarded a Presidential Unit Citation. The president had a framed print of Ecker’s aerial picture of the missile sites on the wall of his office in the White House until the day he was assassinated. This is Joe Rex today at 83. He and his wife live in Englewood. This story was first printed in the Charlotte Sun newspaper, Port Charlotte, Florida on Monday, August 9, 2010. It is republished with permission.